FORT LAUDERDALE, Fla. (AP) _ Gov. 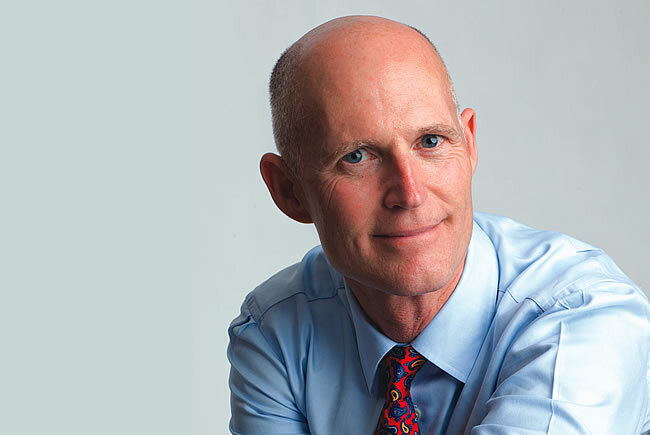 Rick Scott is heading to Washington to try to convince the Obama administration to release federal hospital funds, but he insists that he will not support expanding Medicaid insurance to more than 800,000 Floridians. The Republican governor wants an extension on the more than $1 billion in low income pool funds, set to expire June 30th, for hospitals that treat low-income and Medicaid patients. But the federal government wants states to expand Medicaid under the Affordable Care Act, arguing it’s more efficient to give people money to help buy health insurance than to pay hospitals for caring for the uninsured retroactively. The gridlocked Florida Legislature is also anxiously awaiting the outcome of Scott’s meeting with Health and Human Services Secretary Sylvia Burwell on Wednesday. Lawmakers need a decision so they can create a budget before they convene for a special session. Federal health officials warned that the funding was ending when they granted a rare extension more than a year with the condition that the state come up with alternative funding streams. Despite a year’s worth of warnings, Scott complained the decision was abrupt, then insisted that the federal government would reconsider and release the funds. Meanwhile, the governor offered no backup plan and the legislative session imploded over the stalemate, with the House abruptly adjourning three days early last week. But the Obama administration has not wavered on its stance that hospital funding should not pay for costs that would be covered in a Medicaid expansion. The governor filed a lawsuit last week accusing federal officials of illegally coercing the state to expand Medicaid to get the hospital funds. Governors in Kansas and Texas have also pledged support. Scott also announced Tuesday that he’s convening a special health care commission to evaluate hospitals that receive tax dollars, saying he wants to look at hospital executives’ salaries, bonuses, lobbying and campaign contributions. The governor, who is the former executive of a hospital chain snagged in a massive fraud scandal, has hinted that Florida hospitals are not in as bad financial shape as they maintain. “It is appropriate and necessary to review Florida hospitals, insurance and health care providers and how any taxpayer money and government polices contribute to the quality, profits (including executive compensation packages), and losses of these institutions, and their impact on the affordability, access and quality of health care services for Florida families,” Scott said in his executive order. During three public meetings last week, hospital executives told Florida health officials they would be forced to cut services or shut down with the LIP funds. It’s unclear who will be named to the panel, whether it will be a mix of Republicans and Democrats, what qualifications participants must have and when they will meet. The head of the Safety Net Hospital Alliance of Florida requested it be represented on the commission. “Florida’s safety net hospitals are transparent and accountable and look forward to sharing with the commission how they achieve operational efficiencies while providing high-quality health care to all patients seeking treatment, regardless of their ability to pay,” said President Tony Carvalho.